This past summer, I mastered crafty multitasking. After all, what can you do while waiting for your kid at soccer camp? Hand-baste hexagons! What can you do while playing a game of Pokémon? Hand-baste hexagons! What can you do when your children are acting like trolls and school doesn’t start for another two weeks? Lock yourself in your bedroom and hand-baste hexagons! I should warn you, though: When this trend persists throughout different situations during your summer, you end up with a big backlog of hand-basted hexagons. My first batch of hexagons resulted in this rainbow-adorned pillow. From the second batch I sewed another pillow, this one in black Essex Linen and Denyse Schmidt’s New Bedford line. I used mini-charm packs for many of the hexagons I basted this past summer, but for this pillow I opened up a bundle of New Bedford and cut a 2.5-inch square from many of the fat quarters in it. Two of the fat quarters then went into sewing the back. 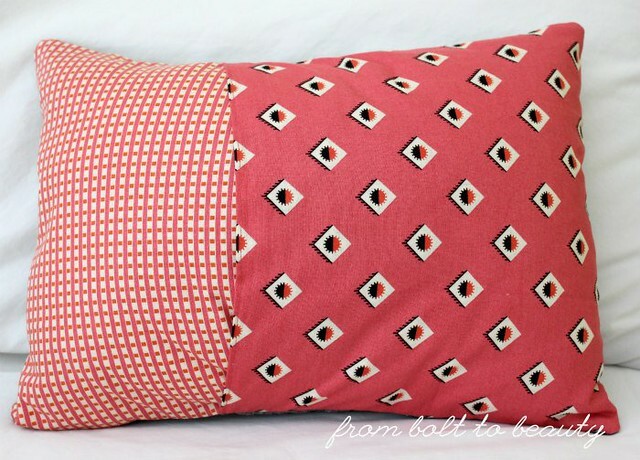 With its French backing and simple knife edges, this pillow was easy-peasy to sew together. There are more hexagon finishes to come, but for now, I’d love to know what you’ve finished lately. 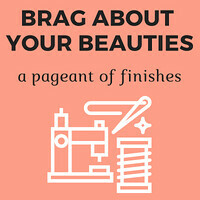 That’s my suave segue to the Brag About Your Beauties Pageant, a new linky that will run every Friday except the first Friday of the month. • Visit and comment on other participants’ finishes. UPDATE: The giveaway is closed. The lucky winner is Alice, aka alidiza! 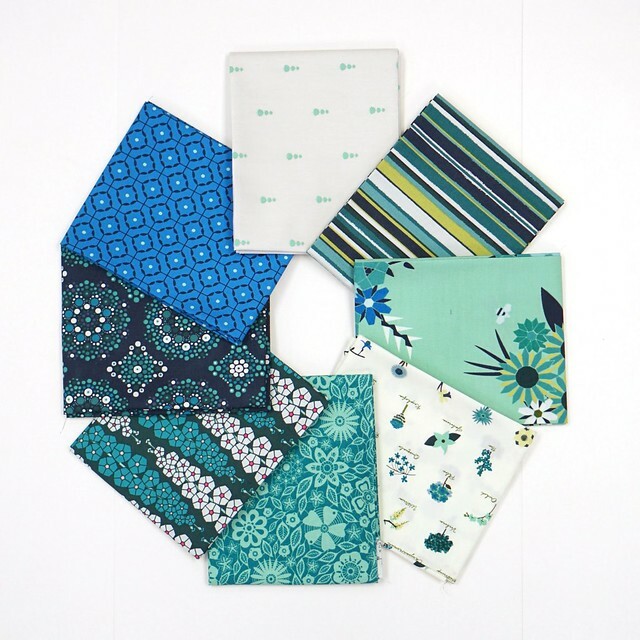 You have two opportunities to enter to win this fabric bundle: (1) Upload your link to the Beauties Pageant (just one link, please!) and/or (2) leave a comment on this post (just one comment, please!). Also: If you read my posts through Bloglovin’, click through to my original post to comment. This giveaway is open internationally. Due to the cost of shipping, if you’re an international reader and you win, you will get a US $30 gift certificate to a local-to-you quilt shop instead of the fabric bundle. This giveaway is open through 6 p.m. Eastern Standard Time on Thursday, September 20. The winner will be notified via email, so if you’re a no-reply blogger or comment anonymously, please include your email address in your comment or send it to me at frombolttobeauty (at) gmail (dot) com. I look forward to seeing more of your hexie finishes. The black essex linen is a great backdrop for this grouping! Thank you for hosting the new link up and I'm excited to have something to share this week. Always love a linky party;) Thanks for starting this one up! I am not a big hexie fan, but yours are lovely! Thank you for the giveaway! Beautiful!!! You know I'm hexie obsessed;-) Having fun checking out what everyone has been up to. Very sweet of you to have a giveaway! I loved what a got at crosscut at the AMH class in April! She has such a lovely aesthetic!! I agree: You can tell that she chooses the fabric in her shop with care. I think of her store as more of a curated selection of modern fabric. The shop is a bit of a trek for me (even more for you! ), but it's worth it. How nice of your LQS to sponsor your giveaway. 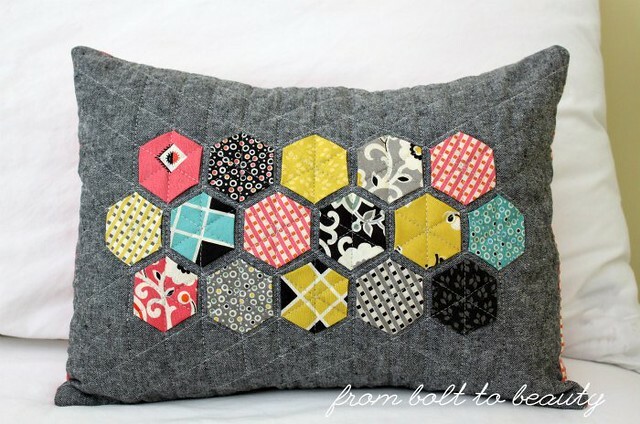 I love the hexie pillow. Ha! I could totally see hexies being obsessive! I've been there but it didn't stick as long for me as sashiko did. ;) Yours make up the perfect little pillow. You're such a sweetie, Gloria. Thanks for your kind words. BTW: You're a no-reply blogger. Please send me your email address at frombolttobeauty (at) gmail (dot) com in case you win. Thanks! I love the colour combo of the turquoise/red/yellow but especially how they're all variants of pure hues. And thanks for hosting a new linkup! I'll be back for sure. I love the palette, too. Denyse's color tend to have gray undertones, which I really like. Nicole, you're a no-reply blogger. Please send me your email address at frombolttobeauty (at) gmail (dot) com in case you win. Thanks! 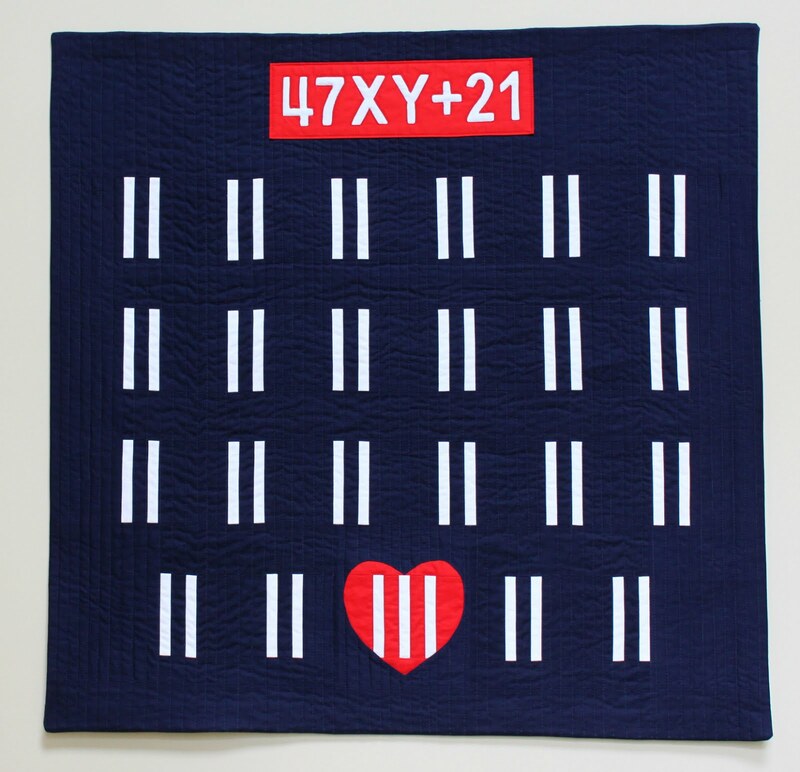 Hi there I'm new to quilting and I'm 17 years old I really hope that I win this giveaway and I absolutely love your blog thank you so much for the helpful tutorials and lovely thought of having a giveaway. Welcome! You must be having fun figuring out what you like in the world of quilts and what kind of quilts you want to make yourself. You're a no-reply blogger. Please send me your email address at frombolttobeauty (at) gmail (dot) com in case you win. Thanks! Hexies are a great way to spend some "me" time. I love your stories!! Thanks so much for the blog and all the great ideas I find here. Thanks for the give away - it'd be great to win and have some awesome fabric to work with. I love the rainbow hexie pillow! And the fabric bundle is gorgeous! Is it cut in a hexagon and then the edges folded under? Michelle, I really like your hexie pillow. 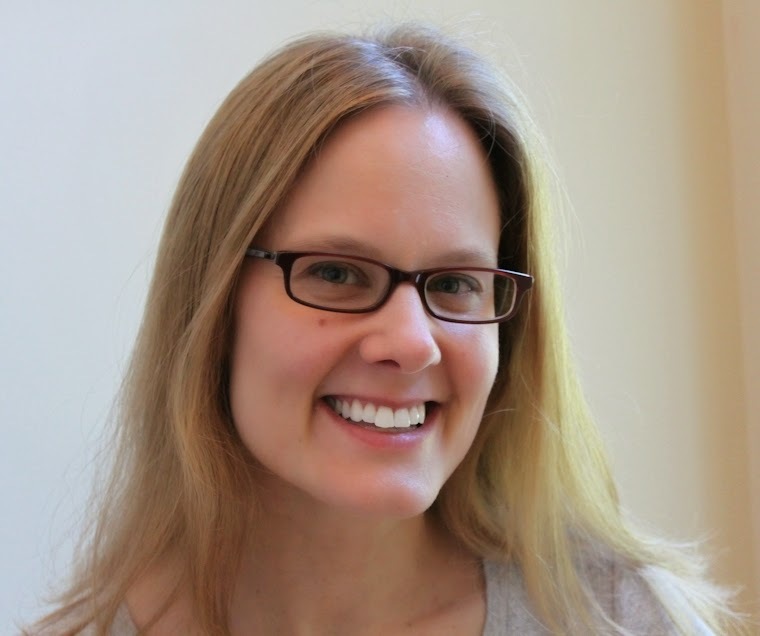 I am going to try to join your linky party with a blog post in the next couple days. Take care, Mary. Your hexie pillow is fantastic and thanks for the chance to win this giveaway. Hi: Yay for a new link up party! I am with Roseanne - let us know when you make a button so we can all start sharing this! I am excited for your new linky party!! Hello Michelle! I will visit often to ogle other peoples finishes I'm sure (and maybe have a few of my own). Hi! 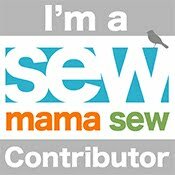 I’m so glad I found your blog through Bernie’s post! I live in Southeastern MA and will be sure to check out that quilt shop if I’m in the area sometime. Now, I will enjoy following your blog! Bernie's heading folks your direction! Nice to have a new link up for quilty finishes. 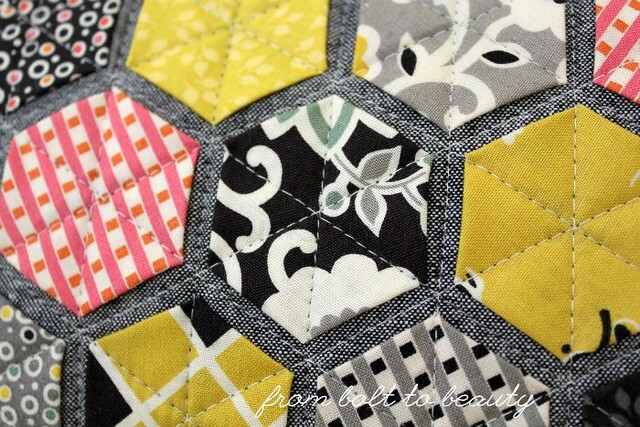 Hexies are a quick take along project. The black linen sure helps show off the gorgeous fabrics. Thanks for giveaway.